A UNESCO world heritage site, the famous Royal Botanic Kew Gardens in South-west London are a living library of as many exotic plants, trees and flowers you can possibly imagine. Impressively, they are actually the largest botanical gardens in the world! Admire the foliage as you stroll across the skies from the treetop walkaway, or stop by the tranquil Japanese Gardens, to name just a few of the unique corners of the gardens. 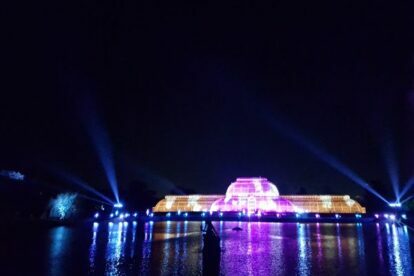 Although the gardens are a treat to visit any time throughout the year, during the festive season Kew Gardens celebrates ‘Christmas at Kew’ with a winter trail, allowing guests to navigate round the grounds enjoying a variety of spectacular light shows. Amble past millions of glittering lights, mind-boggling illuminations and stunning performances of dancing laser beams, jets of light and bright kaleidoscopic projections. Stop off by one of the cosy huts for a sweet treat – a crumbly mince pie perhaps, or a gooey marshmallow to melt on one of the roaring fire pits. And don’t forget the obligatory cup of warm mulled wine!